Crash while flying around in creative near desert temple. It was a completely new world (13w22a). Was flying around looking for stuff. Game crashed. It never crashed like this before. Game shut off, launcher showed the crash report. After i posted the report i turned the game back on and it runs fine. 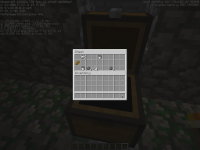 I searched for the chest and all the stuff that supposed to be in it was not (look picture).